The confidence, courage, and resolve in many of the greatest Bible heroes and world-changers are the result of a single, powerful, biblical principle. It’s a principle woven into very foundation of creation that, when applied, has the power to calm chaos, overcome obstacles, and win every battle. The secret? Activating the power of God’s spoken Word. Words are powerful! They can either give life or bring death, yet many believers re ignorant of the power they possess in their own mouths to bring change and transformation to the world around them. In his latest book, Kyle Winkler takes the believer on a journey to discover the supernatural power of declaration. 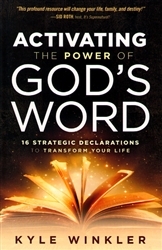 In Activating the Power of God’s Word, you will receive biblical keys from the Word of God to make strategic declarations that will bring the change that you deeply desire. This is more than a book; it is a manual for supernatural breakthrough. If you’ve ever wondered how your Bible heroes landed in the Hall of faith, you need to read Kyle Winkler’s new book. This book reveals a fresh revelation on the power of the spoken Word and offers practical examples. 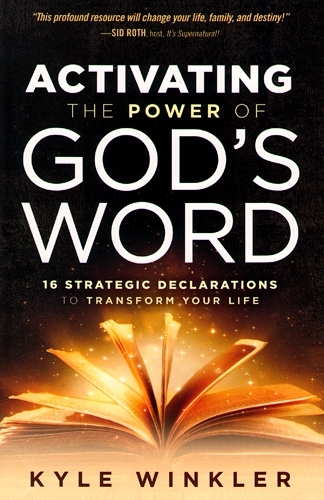 The declarations within these pages will build your faith in who God says you are and what you can do in His name. Whether you’re facing battles or walking in victory, this book will encourage you to press into new dimensions of breakthrough in your life. Kyle Winkler equips people to live in victory. His highly acclaimed mobile app, Shut Up, Devil! ranks as a top Christian app for iPhone and Android. As a sought-after speaker and frequent guest on Christian media, Kyle is known for using his own story to boast in the power of God’s Word for victory over fear, insecurity, and issues of the past. He holds a Master of Divinity in Biblical Studies from Regent University. Kyle’s recent book, Silence Satan became a best-selling spiritual warfare book, empowering thousands to shut down the enemy’s attacks, threats, lies, and accusations.